Because everything I sell is made from scratch, there are nearly limitless possibilities for customization of your piece. 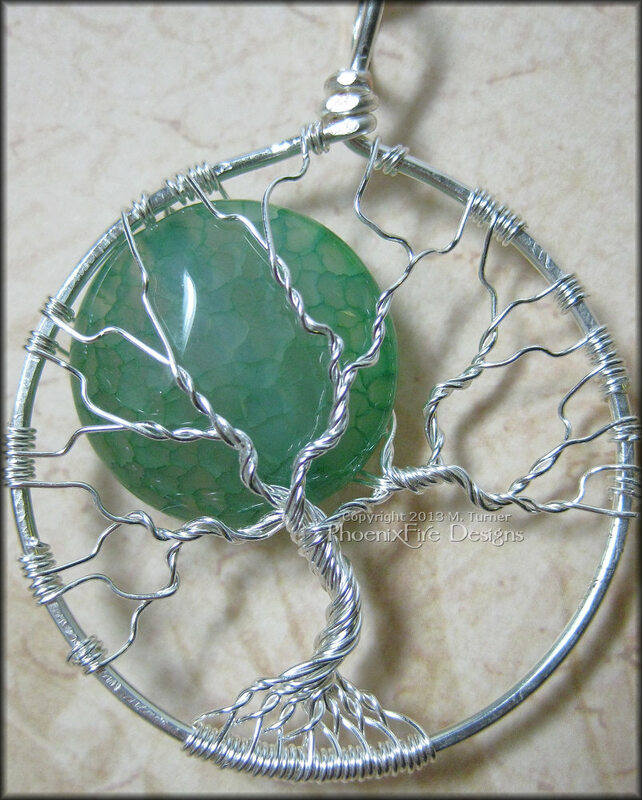 Many times, I get requests from people who want a pendant in the same style as one offered, but they would prefer something changed; a different color wire, different gemstone, etc. 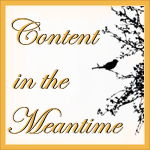 Often, the pieces become deeply personal as a result. Here are some examples of custom work and personalized pendants. 10mm Natural Rainbow Moonstone set in 14k gold fill wire. I normally offer this in silver but the customer wanted gold. She also requested I use a moonstone with more “green” flash to off set the gold wire so I hand selected just the right gem. 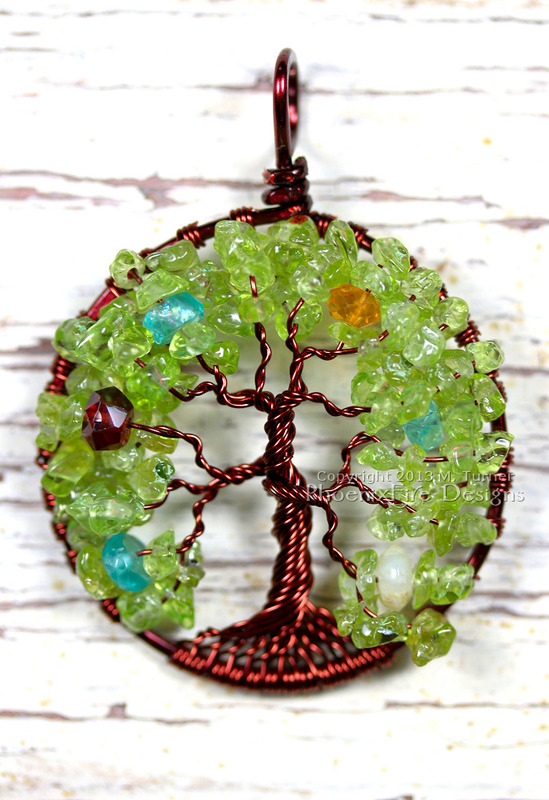 This custom family birthstone tree celebrates the birthstones of those in the family. A pair of sterling silver angel wings were added by request into the final December branches in memorial and remembrance of a child who passed. 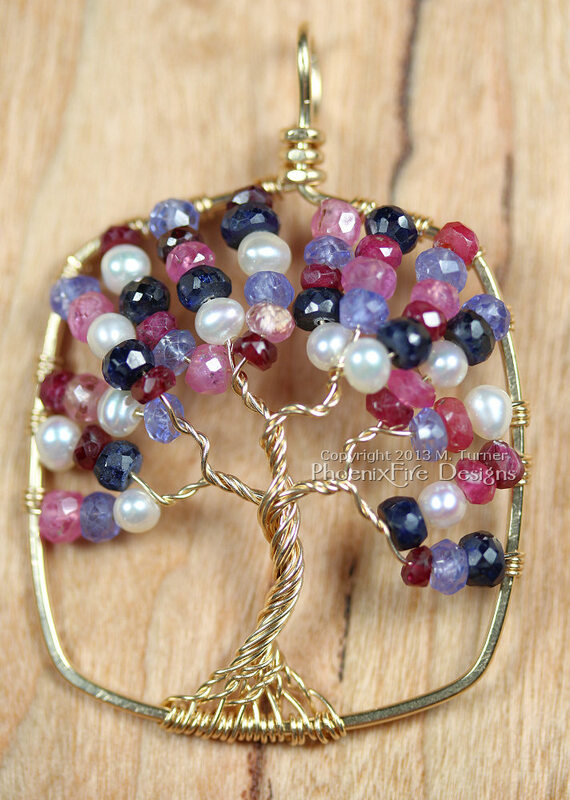 Custom tree of life pendant in SOLID 14k gold and featuring shaded rubies (both red and pink), blue sapphire, tanzanite and freshwater pearls. 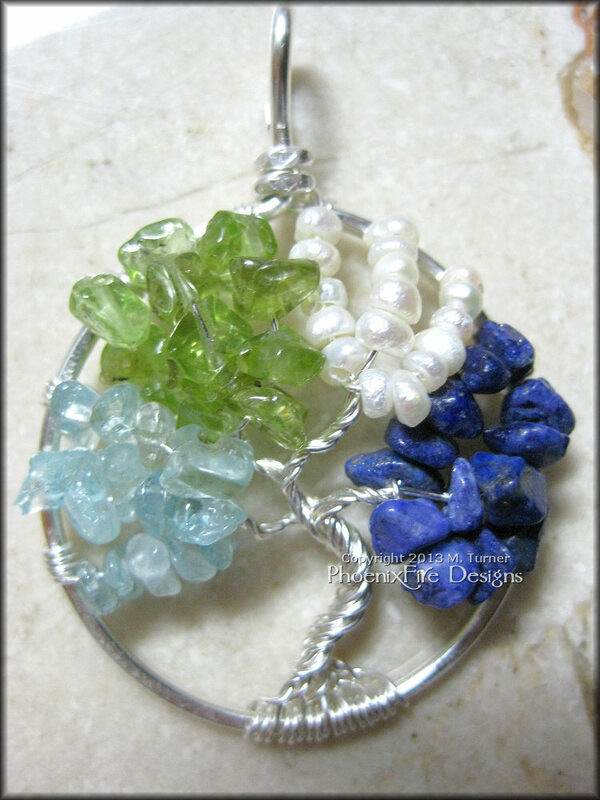 This was a birthstone tree representing the parents, twins, and pearl for their wedding. 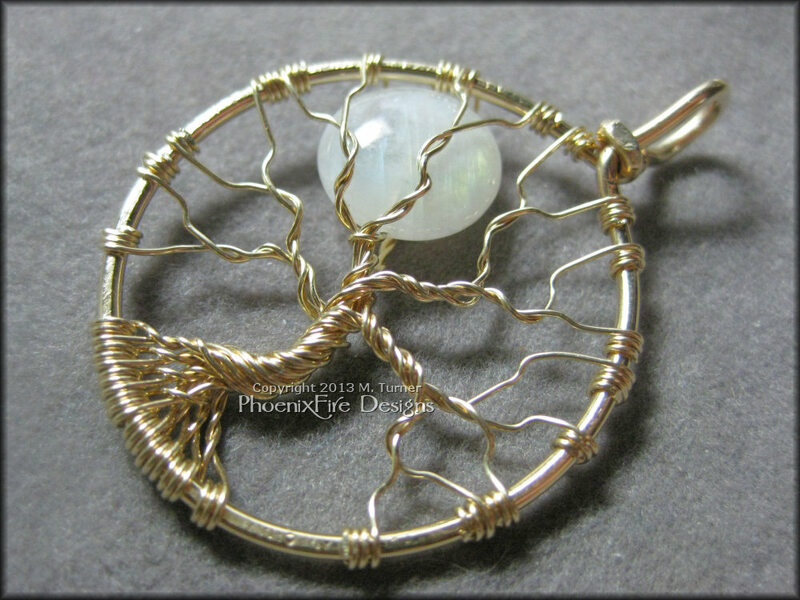 Extremely lush custom “Oak Tree” with two dozen branches in brown wire, peridot leaves and scattered birthstones (December blue zircon, January Garnet, November Citrine, October Opal) in the branches. 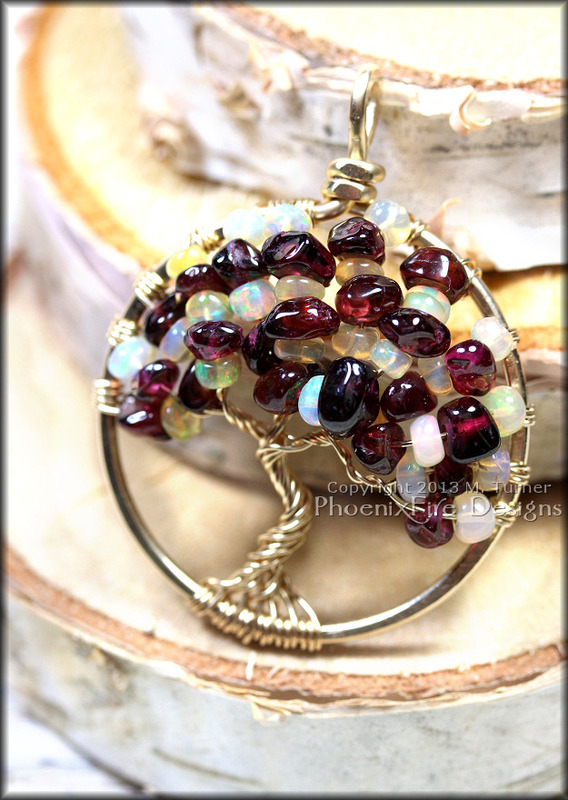 This custom tree of life pendant is set in 14k gold fill wire and features garnet gemstone nuggets and beautiful Welo Ethiopian Opal rondelles with the most stunning blue flash and fire. 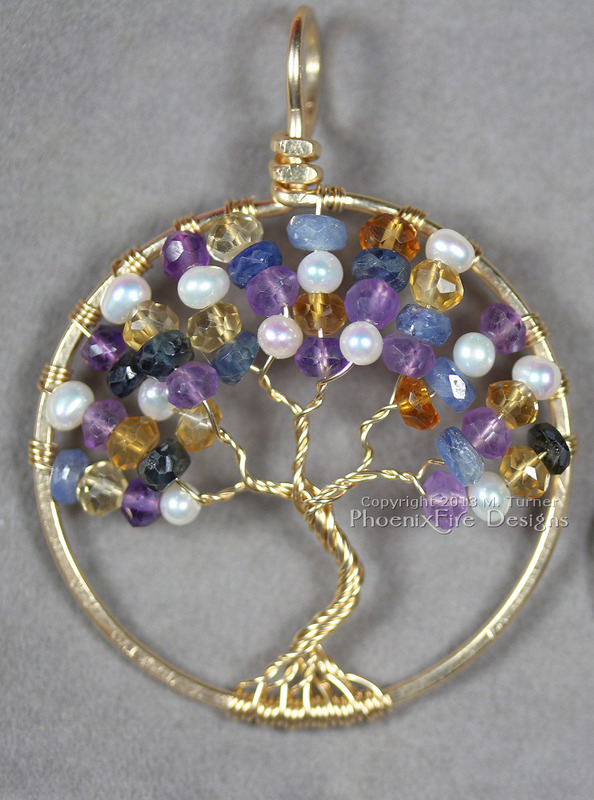 Custom 14k gold fill tree with an assortment of beautiful gemstones including blue sapphire, citrine, amethyst and freshwater pearl. 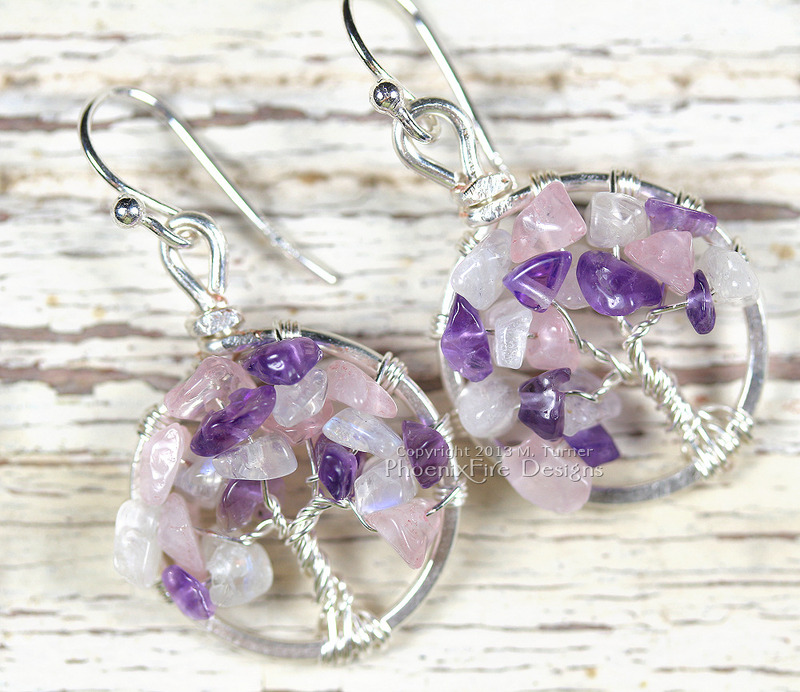 Custom miniature tree of life earrings with amethyst, rainbow moonstone and rose quartz gemstone chips and hanging from sterling silver hooks. 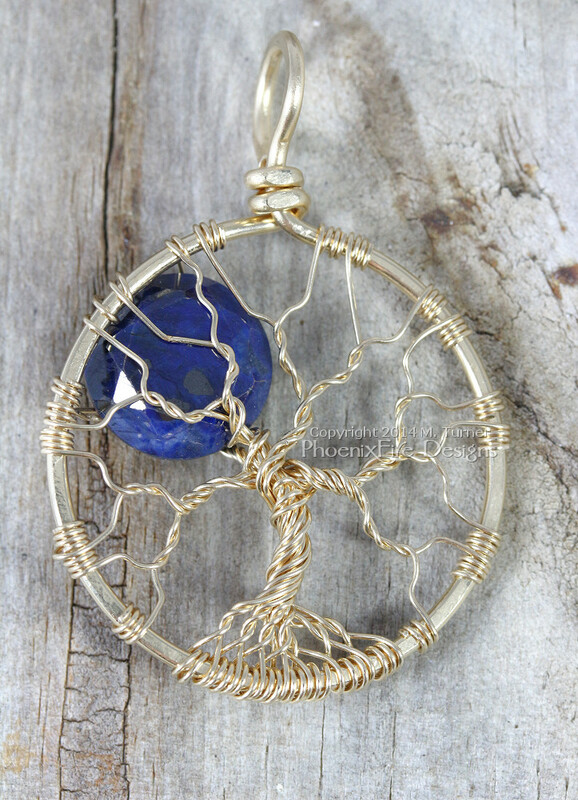 Custom tree of life pendant in SOLID 14k gold wire and featuring a faceted natural blue sapphire round coin bead “moon” within the branches. This was made to celebrate a new baby girl born in September. Sapphire is the birthstone for September. 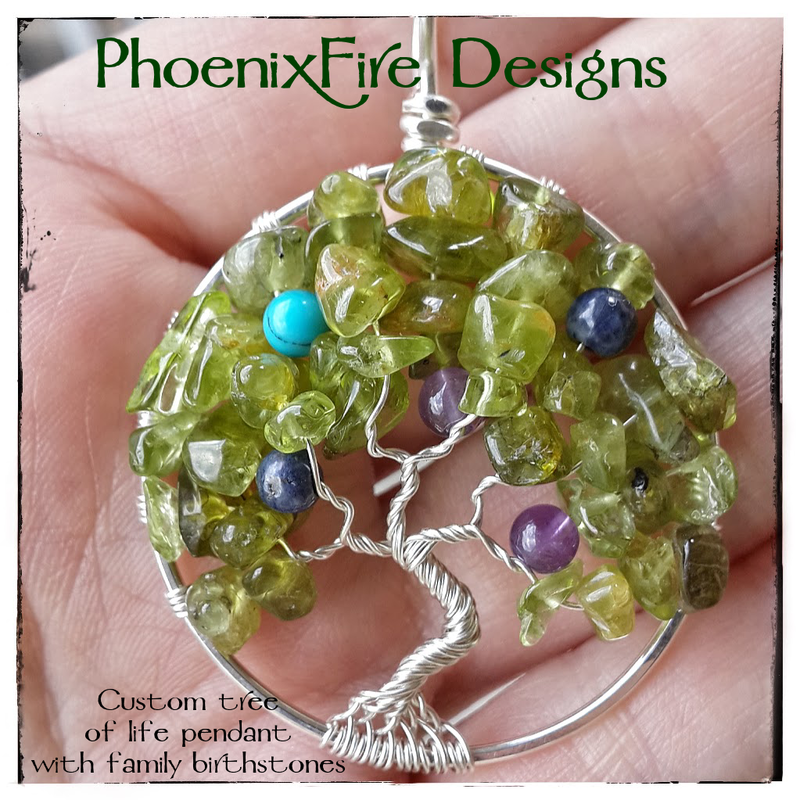 Family Tree with peridot gemstone leaves and accents of round birthstone “fruit” within the branches to represent family. 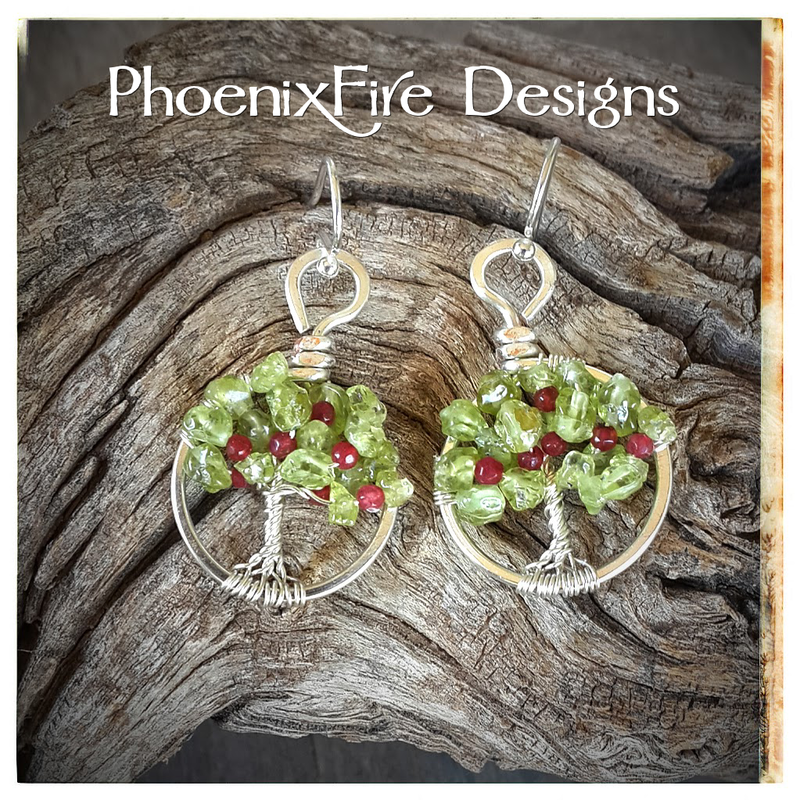 Custom miniature apple tree earrings wire wrapped in silver with peridot leaves and tiny ruby red jade apples in the branches on .925 sterling silver hooks. 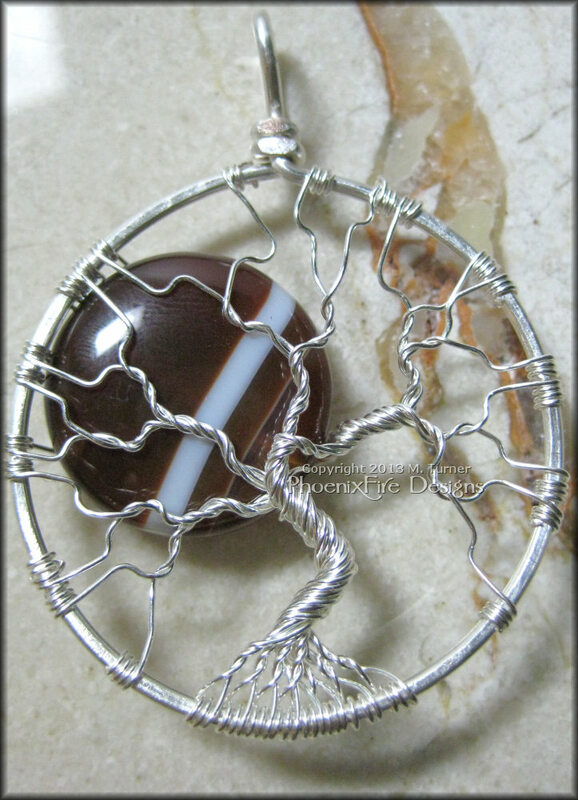 Full Moon tree with a custom Sardonyx gemstone “moon” set in non-tarnish silver plated wire. The customer told me what gem she was looking for and I gave her options. She then was able to select the exact gem. 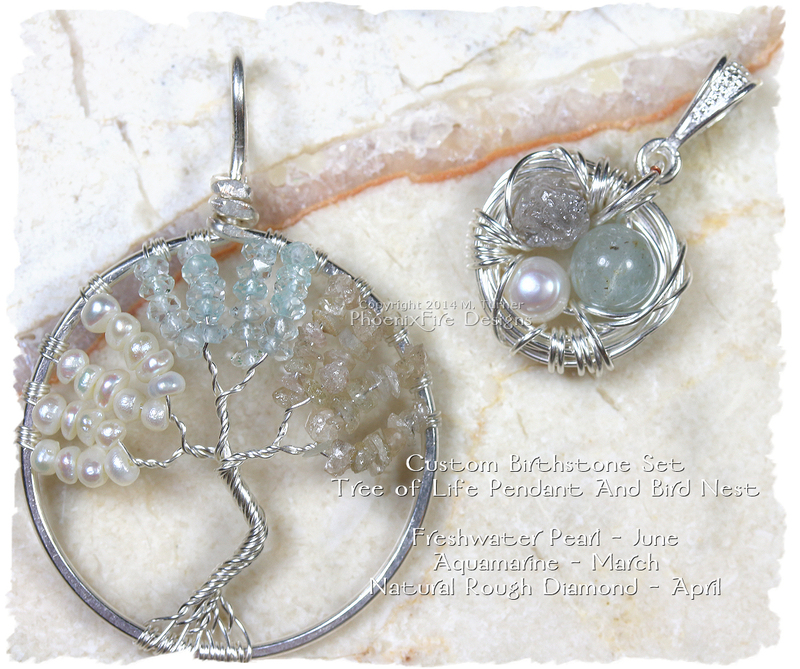 Custom Birthstone Tree of Life Pendant and Matching Bird Nest Pendant set in sterling silver and featuring freshwater pearl (birthstone for June), Aquamarine (birthstone for March) and natural rough diamond (birthstone for April.) Bird nest has the same three gemstones. This request had many specific details with personal symbolism. 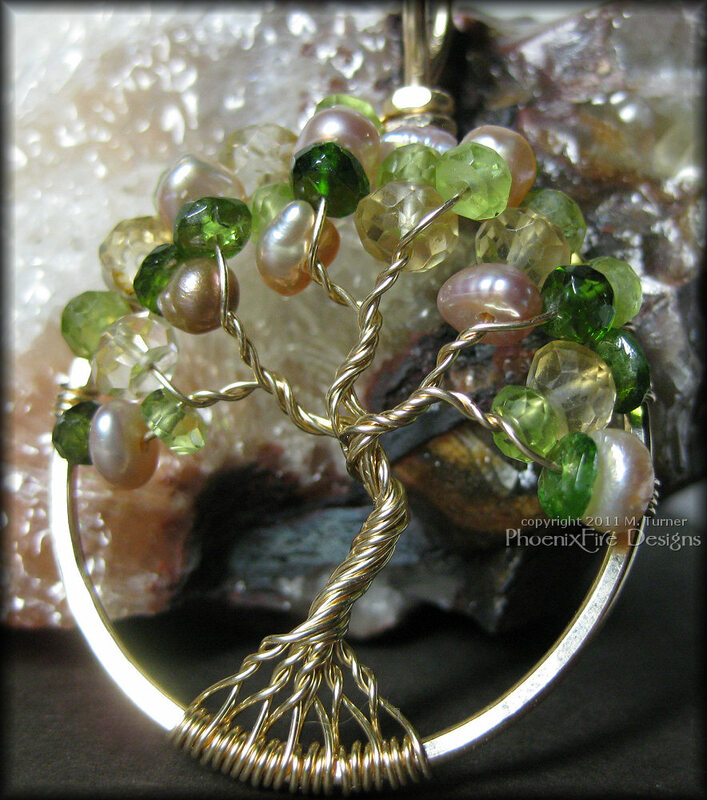 A mix of non-tarnish silver and copper wires blended together, with a natural 6mm moonstone “moon”, plus a natural peridot rondelle on the left near the trunk and a single natural tanzinite on the right up in the branches. 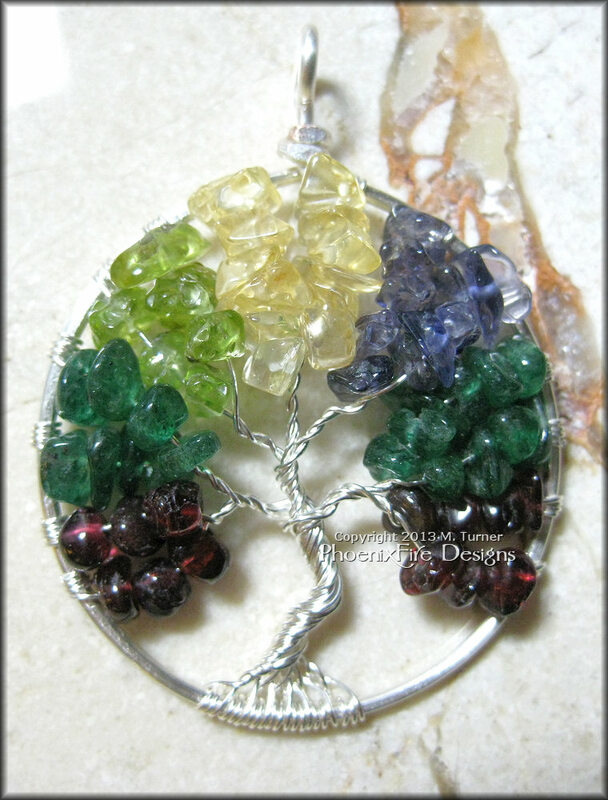 On this one, the customer had specific request of colors to represent birthstones and family members. Garnet for January; Dark Green Aventurine for May’s traditional Emerald; Peridot for August; Citrine for November and Amethyst for February. 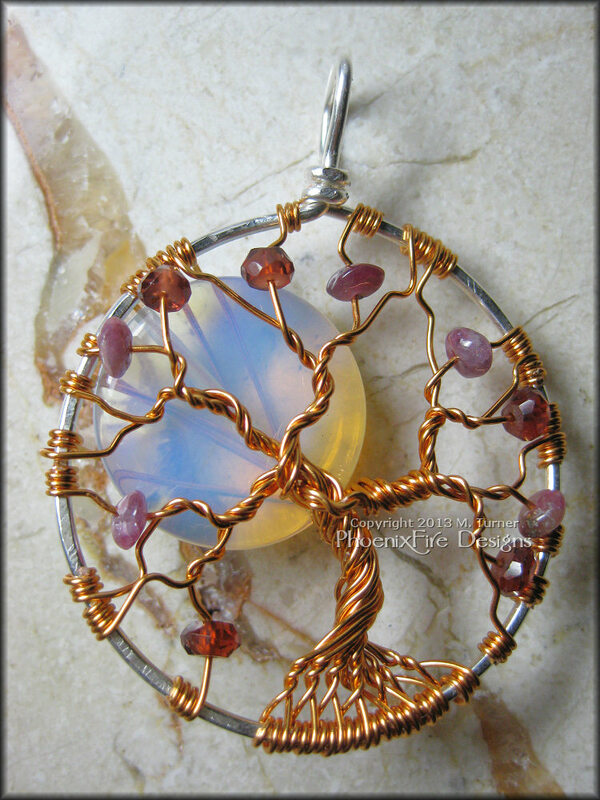 For this one, my customer requested the Opalite Moonstone Full Moon style to be in copper wire and also wanted a small scattering of a mix of pink tourmaline and garnet rondelles in the branches. 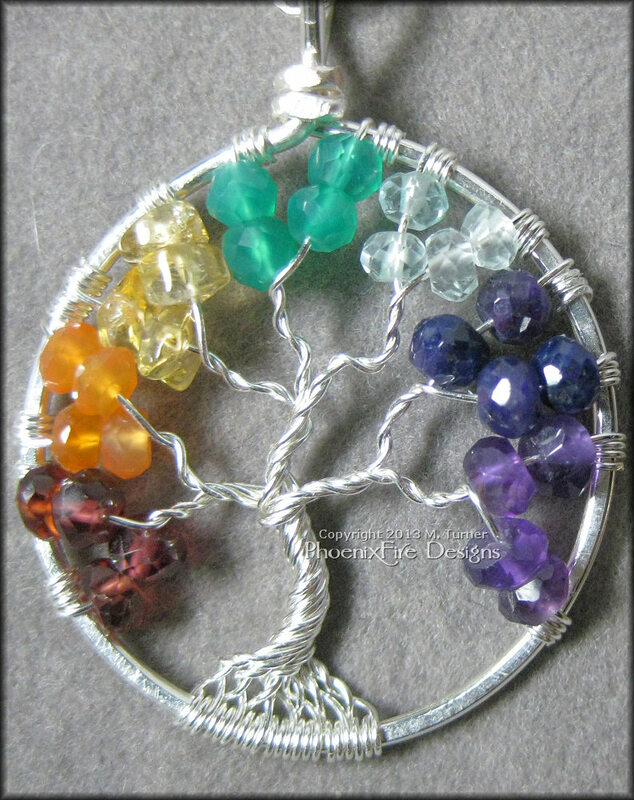 This is another family tree with birthstones. Aquamarine for March, Peridot for August, Pearl for June and Blue Lapis Lazuli for September’s Blue Sapphire. For this, my customer wanted to get a special tree for his wife who is a Yoga instructor. 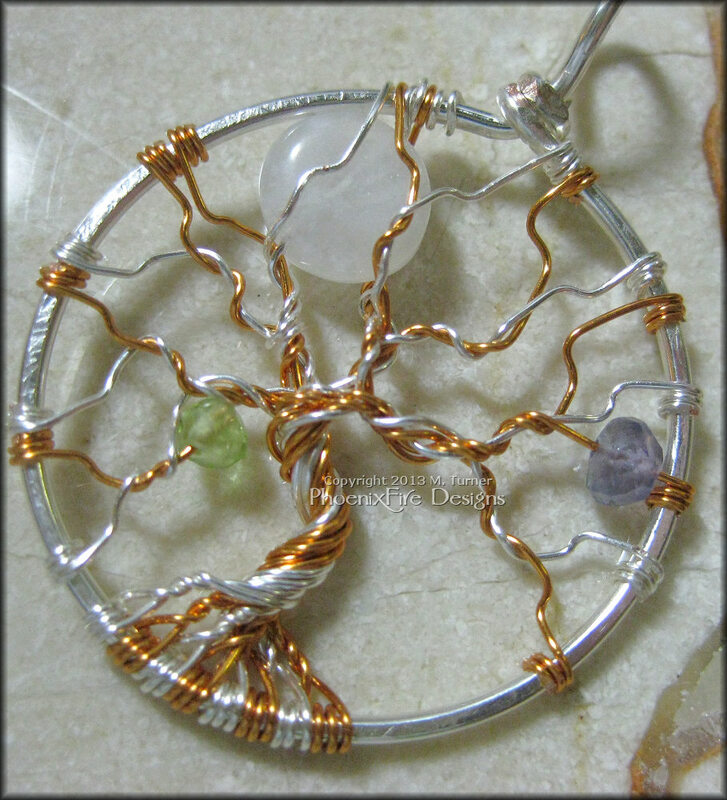 Using the seven colors of the Chakra, I made this tree to celebrate her passion. 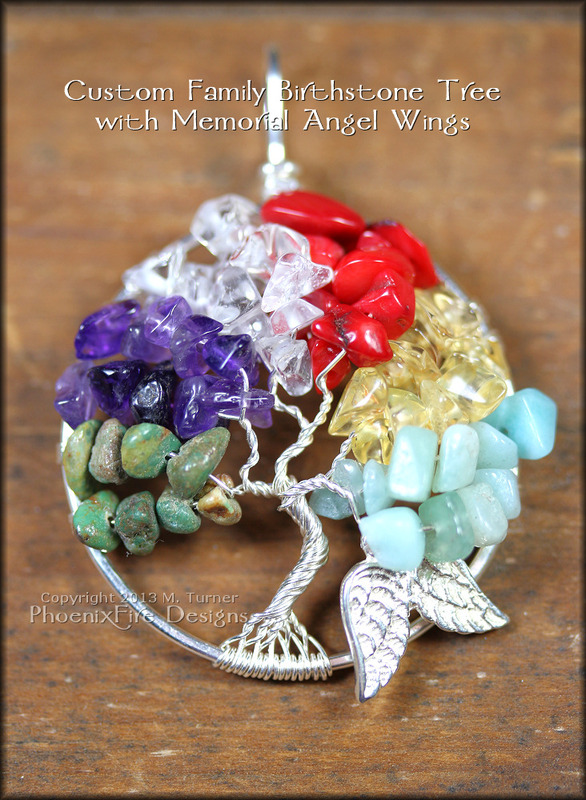 With Garnet, Carnelian, Citrine, Green Aventurine, Blue Topaz, Blue Sapphire and Amethyst. The customer wanted a “Full Moon” style tree but with a green moon. Her Mom’s favorite color is green so I gave her several options and she picked out this fire crackle agate in green. This piece is a custom birthstone piece in 14k gold fill wire and featuring Chrome Diopside for May (Emerald), Imperial Yellow Topaz for November and Freshwater Pearl for June. 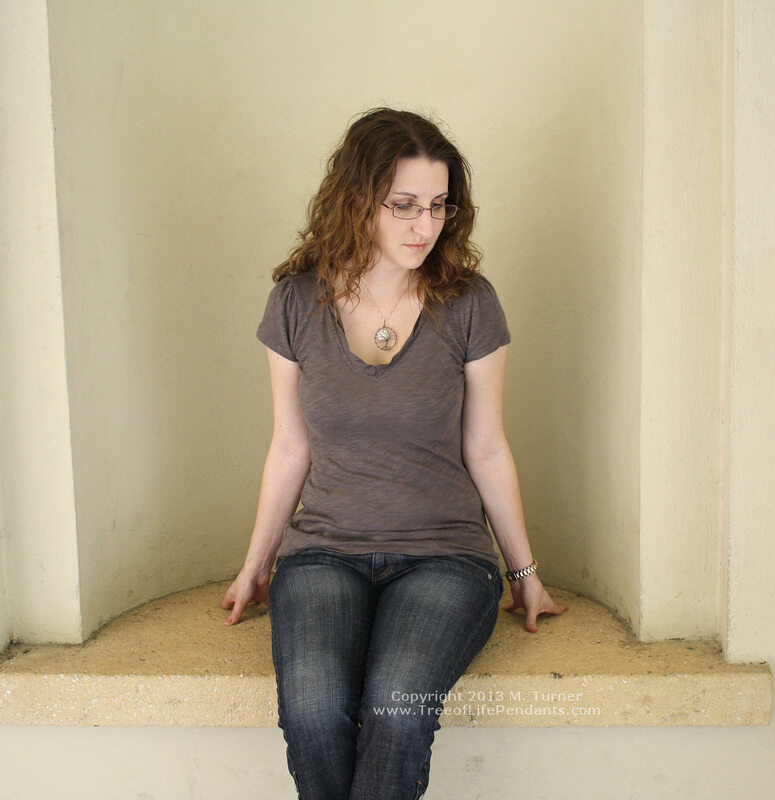 As you can see, there are so many ways to personalize your pendant! I always am happy to work with you to make something custom. You tell me what you have in mind and I’ll make it happen. I’ll show you options, you can make your selection(s) and I will make the piece just to your preferences.